Hiring? Toptal handpicks top iOS engineers to suit your needs. Apple has done a great job of abstracting many of the complexities of managing mobile hardware in easy to use iOS SDKs, but in some cases, such as networking, Bluetooth, OpenGL, and multimedia processing, classes can be cumbersome due to their goal to keep the SDKs flexible. Thankfully, the rich iOS developer community has created high-level frameworks to simplify most common use cases in an effort to simplify application design and structure. A good programmer, employing ios app architecture best practices, knows which tools to use, why to use them, and when it is better to write your own tools and classes from scratch. AFNetworking is a great networking example, and one of the most commonly used open source frameworks, which simplifies a developer’s day-to-day tasks. It simplifies RESTful API networking and creates modular request/response patterns with success, progress, and failure completion blocks. This eliminates the need for developer-implemented delegate methods and custom request/connection settings and can be included in any class very quickly. If your networking code is scattered all over your codebase, this is now a potential nightmare. Hopefully, you have at least some of your parameters defined statically in a common header, but even then you may touch a dozen classes for even the most minor changes. How do we address AFNetworking limitations? Create a networking singleton to centralize the handling of requests, responses, and their parameters. So, a singleton is a class that you would only ever have one instance of in an application that exists for the life of the application. Additionally, because we know there is only one instance, it is easily accessible by any other class that needs to access its methods or properties. It is statically initialized so, once created, it will have the same methods and properties available to any class that attempts to access it. There is no chance for odd synchronization issues or requesting data from the wrong instance of a class. You can limit your API calls to stay under a rate limit (e.g., when you have to keep your API requests under five per second). Static properties such as hostname, port numbers, endpoints, API version, device type, persistent IDs, screen size, etc. can be co-located so one change affects all network requests. Common properties can be reused between many network requests. The singleton object does not take up memory until it is instantiated. This can be useful for singletons with very specific use cases that some users may never need, such as handling casting of video to a Chromecast if they don’t have the device. Network requests can be completely decoupled from views and controllers so they can continue even after views and controllers are destroyed. Network logging can be centralized and simplified. Common events for failure such as alerts can be re-used for all requests. The main structure of such a singleton could be reused on multiple projects with simple top-level static property changes. They can be overused to provide multiple responsibilities in a single class. For example, video-processing methods could be mixed with networking methods or user state methods. This would likely be a poor design practice and lead to hard-to-understand code. Instead, multiple singletons with specific responsibilities should be created. Singletons can hide dependencies and thus become less modular. For example, if a singleton is removed and a class was missing an import that the singleton imported, it may lead to future problems (especially if there are external library dependencies). A class can modify shared properties in singletons during long operations that are unexpected in another class. Without proper thought into this, results may vary. Memory leaks in a singleton can become a significant issue since the singleton itself is never de-allocated. Each singleton should handle a single responsibility. Do not use singletons to store data that will be rapidly changed by multiple classes or threads if you need high accuracy. Build singletons to enable/disable features based upon available dependencies. Do not store large amounts of data in singleton properties as they will persist for the life of your application (unless manually managed). First, as a prerequisite, add AFNetworking to your project. The simplest approach is via Cocoapods and instructions are found on its GitHub page. While you are at it, I’d suggest adding UIAlertController+Blocks and MBProgressHUD (again easily added with CocoaPods). These are clearly optional but this will greatly simplify progress and alerts should you wish to implement them in the singleton on the AppDelegate window. Ok, so you likely won’t mix #define, static const, and @property all at once like this but simply showing for clarity your options. “static const” is a better declaration for type safety but #define can be useful in string building since it allows using macros. For what it’s worth, I’m using #define for brevity in this scenario. Unless you are using pointers, there isn’t much in-practice difference between these declaration approaches. Now that you understand #defines, constants, properties, and methods, we can remove those and move on to more relevant examples. Imagine an application where the user must be logged in to access anything. Upon app launch, we’ll check if we’ve saved an authentication token and, if so, perform a GET request to our API to see if the token has expired or not. We’ll add a token check to the NetworkManager and get feedback on the check via completion blocks. You can design these completion blocks however you like. In this example, I’m using success with the response object data and failure with the error response string and a status code. Note: Failure may be optionally left out if it doesn’t matter to the receiving side such as incrementing a value in analytics. Now, in the ViewController.m viewWillAppear method, we’ll call this singleton method. Notice the simplicity of the request and the tiny implementation on the View Controller side. That’s it! Notice how this snippet could be used virtually in any application that needs to check authentication on launch. We can get fancy here and add alerts with AlertController+Blocks on the AppDelegate window or simply send failure objects back to the view controller. Additionally, we could save the user credentials here or instead let the view controller handle that. Usually, I implement a separate UserManager singleton that handles credentials and permissions that can communicate with the NetworkManager directly (personal preference). Oops! We forgot to version the API and send the device type. Additionally, we’ve updated the endpoint from “/checktoken” to “/token”. Since we centralized our networking, this is super easy to update. We don’t need to dig through our code. Since we’ll use these parameters on all requests, we’ll create a helper. #define DEVICE_TYPE UI_USER_INTERFACE_IDIOM() == UIUserInterfaceIdiomPad ? @"tablet" : @"phone"
We’ll stop here but, as you can see, we’ve centralized common networking parameters and methods in a singleton manager, which has greatly simplified our view controller implementations. Future updates will be simple and fast and, most importantly, it decouples our networking from the user experience. Next time the design team asks for a UI/UX overhaul, we will know our job is already done on the networking side! To sum up, by spending a little extra time in early project planning to establish key singleton methods, like the networking example above, your future code can be cleaner, simpler, and more maintainable. 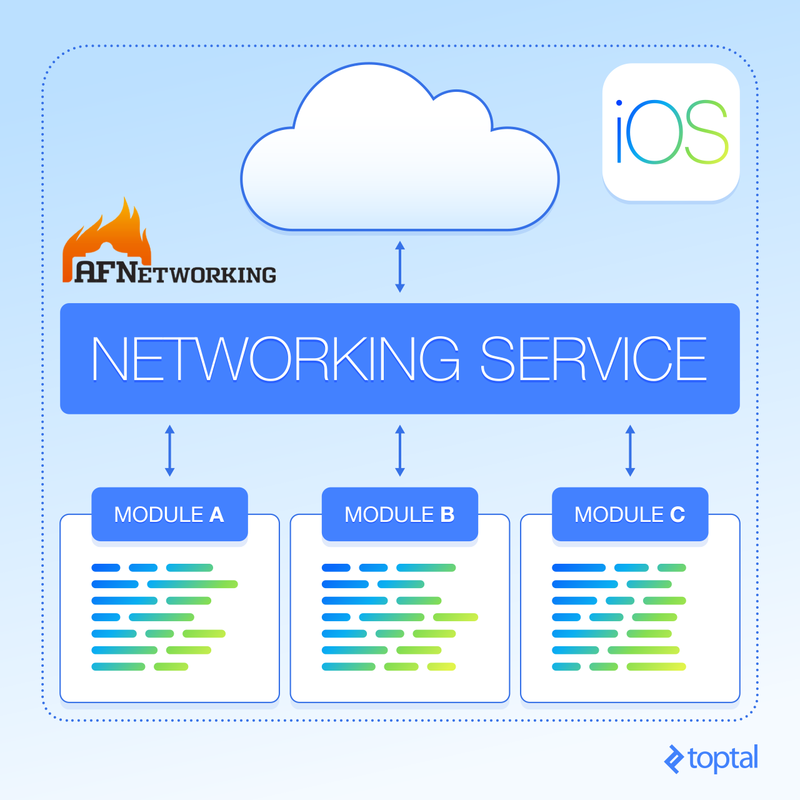 AFNetworking is an open source networking library for iOS and macOS that simplifies a developer’s tasks with a RESTful networking API and creates modular request/response patterns with success, progress, and failure completion blocks. It has a very active developer community and is used in some of the best apps. What is a singleton object? A singleton object is a class that you would only ever have one instance of in an application that exists for the life of the application. Additionally, because we know there is only one instance, it is easily accessible by any other class that needs to access its methods or properties.